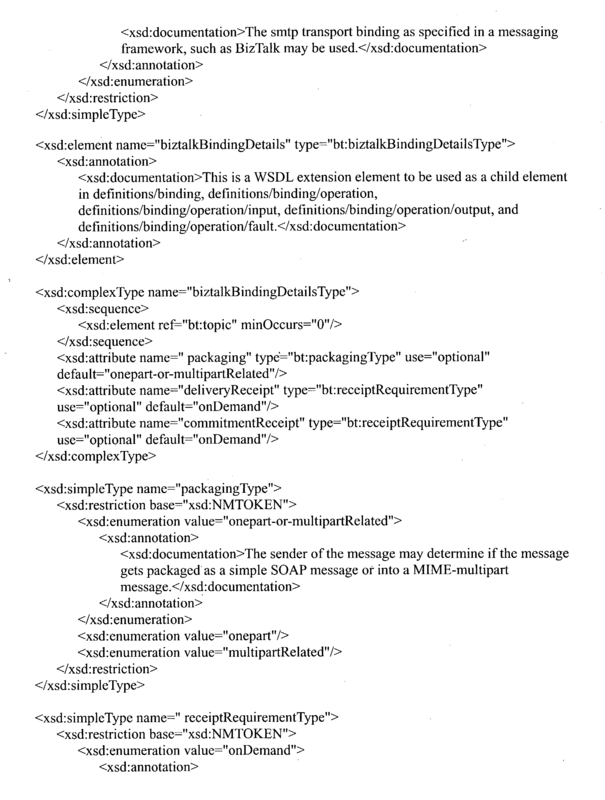 In accordance with an embodiment of the present invention, a web-services interface for a web-service comprises a message binding extension element operable to specify a format for a message requesting the web-service and a binding details extension element operable to specify an availability status of at least one receipt for the message. In accordance with another embodiment of the present invention, a method for defining a web-service comprises specifying a format for a message requesting the web-service and specifying an availability status of at least one receipt for the message. FIGS. 5A-5D illustrate a flowchart of an exemplary method for processing, in accordance with an embodiment of the present invention, a message received by the service provider. FIG. 1 is a logical block diagram of a system  10 which may use embodiments of the present invention to advantage. System 10 comprises a service provider 12 and a service requestor 14. Service provider 12 is a provider of at least one web-service 16. Service provider 12 publishes at least one web-services interface 18 based at least in part on a schema 34 (FIG. 3A). Web-services interface 18 preferably comprises a WSDL interface, for example a WSDL document. Web-services interface 18 defines the web-services that service provider 0.12 is capable of providing and preferably includes a binding element extension 32 (FIG. 4A) generated in accordance with schema 34 of FIG. 3A. Web-services interface 18 may also comprise an attachment extension 60 (FIG. 4B) in accordance with schema 46 of FIG. 3B. Service requestor 14 requests one or more web-services 16 by transmitting a message 20 to service provider 12. Both service provider 12 and service requestor 14 may transmit or receive a message. Web-services interface 18 defines or specifies the messaging features for message 20. Message 20 is preferably a Simple Object Access Protocol (SOAP) document that utilizes the BizTalk Messaging Framework specification. Referring also to FIG. 2, in an exemplary embodiment, a web-services server  22 is communicatively coupled with a service requester agent 24. Web-services server 22 may be provided by service provider 12. Web-services server 22 is capable of providing web-services 16. Web-services server 22 may comprise a plurality of ports (not shown) corresponding to one or more operations of the web-service. Service requester 14 utilizes service requestor agent 24 to request web-services from web-services server 22 and/or invoke operations on web-services server 22 via a communications network 26. FIG. 3A is a diagram of a schema  34 for a binding element extension 32 in accordance with an embodiment of the present invention. FIG. 4A is a diagram of a portion of an exemplary web-services interface 18 that comprises binding element extension 32 in accordance with an embodiment of the present invention. Web-services interface 18 is an exemplary web-services interface generated by service provider 12 and made available to service requestor 14. Preferably, web-services interface 18 is a WSDL document. Binding element extension 32 complies with schema 34 of FIG. 3A. Service provider 12 defines additional information about a web-service in binding element extension 32 and informs service requestor 14 about the messaging features desired and/or supported by service provider 12. An exemplary schema is provided in APPENDIX A. A portion of exemplary web-services interface 18 in accordance with schema 34 is provided in APPENDIX B. Schema 34 comprises a plurality of elements and web-services interface 18 comprises a plurality of extension elements in accordance with the elements of schema 34. These elements are discussed in detail hereinafter. Target namespace element  39 preferably defines an identifier that uniquely references an extension to a specification, for example a binding element extension to a specification of a web-services description language. An example of the identifier is a Uniform Resource Locator (URL), for example, http://schemas.hp.com/webservices/wsdl/biztalk. The identifier (not separately shown) specified in a namespace element of exemplary web-services interface 18 of FIG. 4A preferably corresponds to the identifier defined in target namespace element 39 of FIG. 3A. Target namespace element 39 also specifies that an element of a binding element extension 32 of exemplary web-services interface 18 starts with a particular string, such as “bt”. <xsd:documentation>Specifies a possible transport protocol. According to the above example, the transport type definition element specifies the possible values for transport attribute  37. The transport type definition element comprises a restriction base element of type NMTOKEN. NMTOKEN is preferably a name token comprising of one or more characters, such as alphabets, digits, hyphens, underscores and periods. The transport type definition element restricts the name tokens that may be used by defining enumeration values. In the above example, the possible enumeration values are “http” and “smtp”. element header/process/detail of the header of a message. 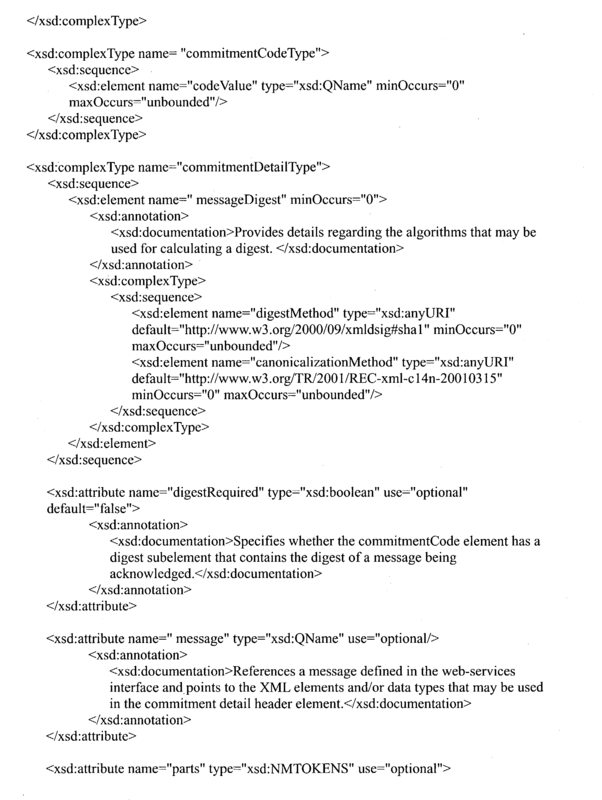 According to the above example, a process extension attribute  38′ of message binding extension element 36′ of web-services interface 18 preferably specifies an identifier, for example a URL, that identifies the schema to be used for an element header/process/detail of a header, say a SOAP header, of message 20. According to the above example, the use of process extension attribute 38′ in web-services interface 18 is optional. Process attribute 38 is of type anyURI, which indicates that any Uniform Resource Identifier (URI) for a process element extension may be specified, for example “http://schemas.hp.com/web-services/biztalk/process_WSDLextension”. The binding definition details element preferably provides a list of elements which comprise binding details element  40 and which, according to schema 34, are to be defined in a binding details extension element 40′ of web-services interface 18. If no binding details extension element 40′ is specified in web-services interface 18 or if some elements, sub-elements, and/or attributes are omitted, then preferably predetermined default values, if any, apply. 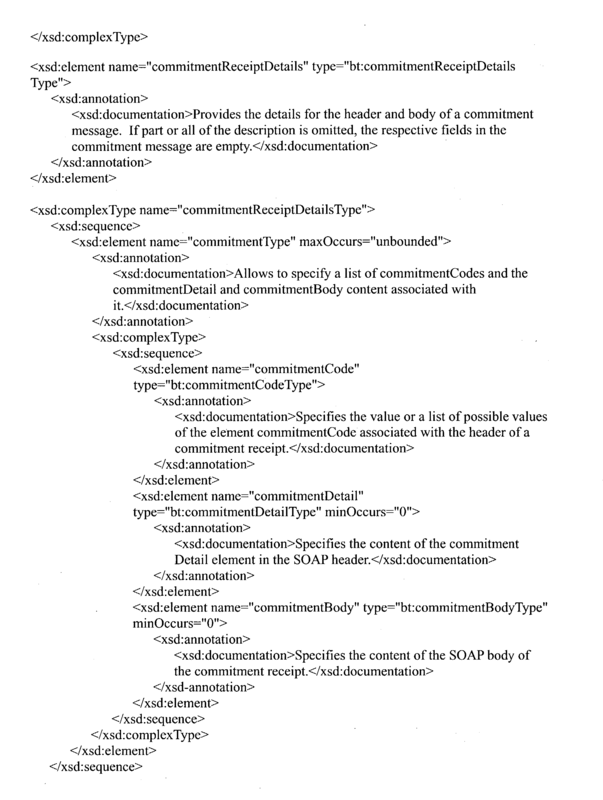 Binding details element  40 comprises a plurality of elements and/or attributes, such as a topic element 40 1, a packaging attribute 40 2, a delivery receipt attribute 40 3 and a commitment receipt attribute 40 4, for example “topic”, “packaging”, “deliveryReceipt”, and “commitmentReceipt”, as listed in the above binding details definition element. According to the above example, the topic rule type definition element comprises a choice element. The choice element provides a choice to service provider  12 in how to specify the value for topic extension element 40 1′. According to the above example, service provider 12 may specify the value for topic extension element 40 1′ in one of three ways. The first element string is of type string, which specifies the exact string that is provided in topic extension element 40 1′. The second element schema is of type anyType, which provides a schema for a segment, for example an XML segment, that is inserted as a string in topic extension element 40 1′. The third element XSL is of type anyType, which provides a rule on how to construct the string for the topic field using an XSL (eXtensible Stylesheet Language) expression. According to the above example, the packaging type definition element specifies the possible values for packaging attribute  40 2. The packaging type definition element comprises of a restriction base element of type NMTOKEN. The packaging type definition element restricts the name tokens that may be used by defining enumeration values. In the above example, the possible enumeration values are “onepart”, “multipartRelated” and “onepart-or-multipartRelated”. According to the above example, a delivery receipt extension attribute  40 3′ of web-services interface 18 preferably specifies if a delivery receipt is desirable. For example a messaging framework, such as the BizTalk Messaging Framework may provide for a delivery receipt, such as deliveryReceipt, that may be sent to the sender of the message indicating that the message has been received and accepted. Delivery receipt attribute 40 3 is of type receiptRequirementType. In the example in APPENDIX A, a receipt requirement type definition element is used to define an element of type receiptRequirementType. Delivery receipt extension attribute 40 3′ is optional in web-services interface 18. If no delivery receipt extension attribute 403′ is specified, then a default value is used. In the example in APPENDIX A, the default value is on Demand. According to the above example, a commitment receipt extension attribute  40 4′ of web-services interface 18 preferably specifies if a commitment receipt is desirable. For example a messaging framework, such as the BizTalk Messaging Framework may provide for a commitment receipt, such as commitmentReceipt, that may be sent by the recipient of the message to the sender of the message indicating that the message has been inspected for correctness of content and committed for processing. Commitment receipt attribute 40 4 is of type receiptRequirementType. In the example in APPENDIX A, a receipt requirement type definition element is used to define an element of type receiptRequirementType. Commitment receipt extension attribute 40 4′ is optional in web-services interface 18. If no commitment receipt extension attribute 40 4′ is specified, then a default value is used. In the example in APPENDIX A, the default value is on Demand. A code value element has a minimum occurrence value (minOccurs) of zero and a maximum occurrence (maxOccurs) value of “unbounded”, which indicates that commitment type extension element  44′ of web-services interface 18 may comprise of one or more commitment code extension elements 44 1′. According to the above example, the message digest element provides details regarding the algorithms that may be used for calculating a digest. In general, a digest algorithm may be used to create a string which represents the message being sent to either service provider  12 or service requester 14. The string may then be used to determine whether the message has been changed or not. The message digest element has a minimum occurrence value (minOccurs) of zero, which indicates that this element is optional in commitment detail extension element 44 2′. The message digest element comprises of a digest method element and a canonicalization method element. According to the above example, the use choice definition element comprises a restriction base element of type string. The use choice definition element restricts the strings that may be used by defining enumeration values. The possible enumeration values are “literal” and “encoded”. A value of “literal” for the use attribute indicates that a concrete schema for the parts in the commitment detail extension element  44 2′ should be provided and the commitment receipt should follow the specified schema. A value of “encoded” for the use attribute indicates that rules are used for encoding and the sender of the commitment receipt should obey the encoded rules. In general, a web-services message, such as message  20, may have attachments. 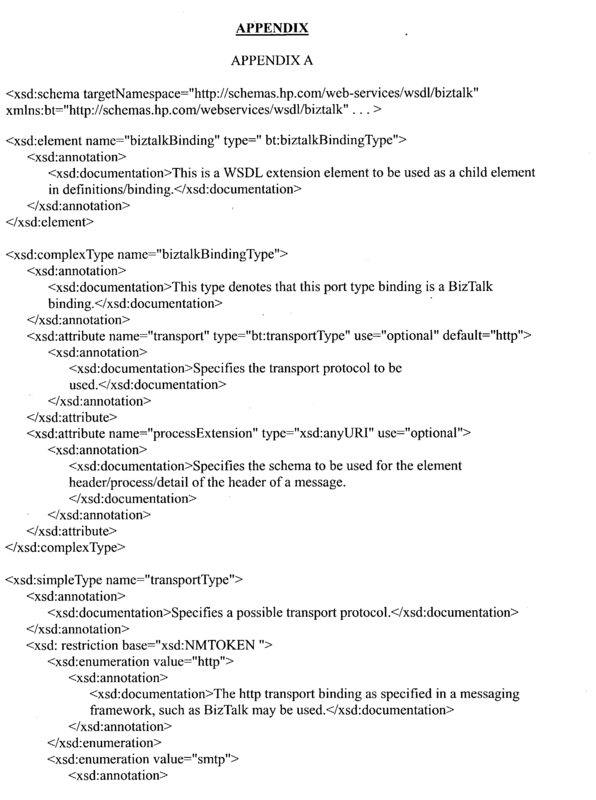 Certain predefined extensions, for example those specified in WSDL specification 1.1, may be used in combination with binding element extension 32 to facilitate binding of messages with attachments. FIG. 3B is a diagram of a schema  46 for attachment extension 60 in accordance with an embodiment of the present invention. FIG. 4B is a diagram of a portion of an exemplary web-services interface 58 that comprises attachment extension 60. If desired, at least a portion of web-services interface 58 may be part of web-services interface 18 of FIG. 4A or at least a portion of web-services interface 18 may be part of web-services interface 58. Attachment extension 60 complies with schema 46 of FIG. 3B. Service provider 12 defines additional information about an attachment to a message in attachment extension 60. An exemplary schema for attachment extension  60 is provided in APPENDIX C. A portion of an exemplary web-services interface in accordance with schema 46 is provided in APPENDIX D. Schema 46 comprises of a plurality of elements. These elements are discussed in detail hereinafter. Schema 46 is used by service provider 12 to create web-services interface 58 defining attachments to a message. An attachment extension in accordance with schema 46 may be specified in predefined locations in the WSDL document, for example “binding/operation/output”, “binding/operation/input”, and “binding/operation/fault”. Target namespace element  48 preferably defines an identifier, that uniquely references an extension to a specification, for example an attachment extension to a specification of a web-services description language. 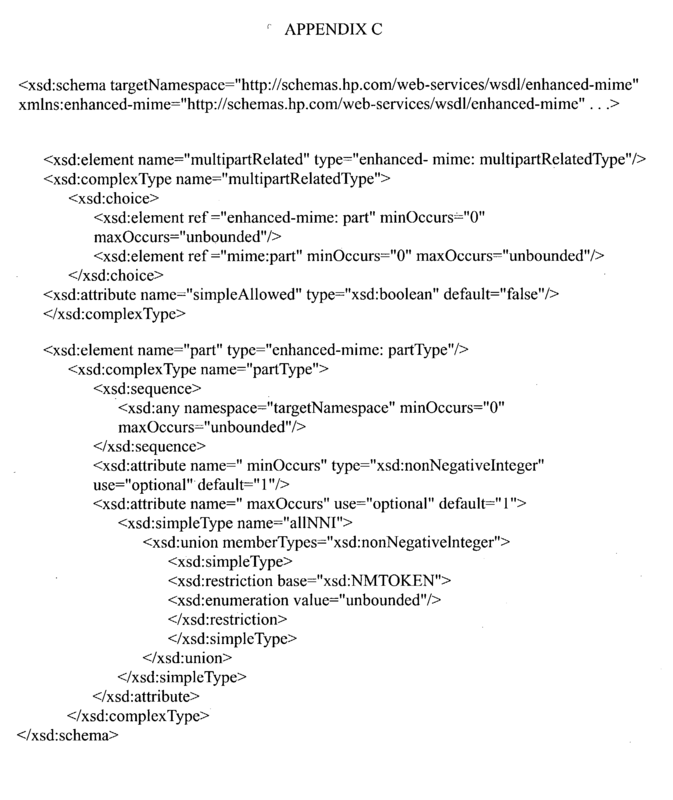 An example of such as identifier is a URL, for example http://schemas.hp.com/web-services/wsdl/enhanced-mime. The identifier specified in a namespace element (not shown) of exemplary web-services interface 58 of FIG. 4B preferably corresponds to the identifier defined in target namespace element 48. 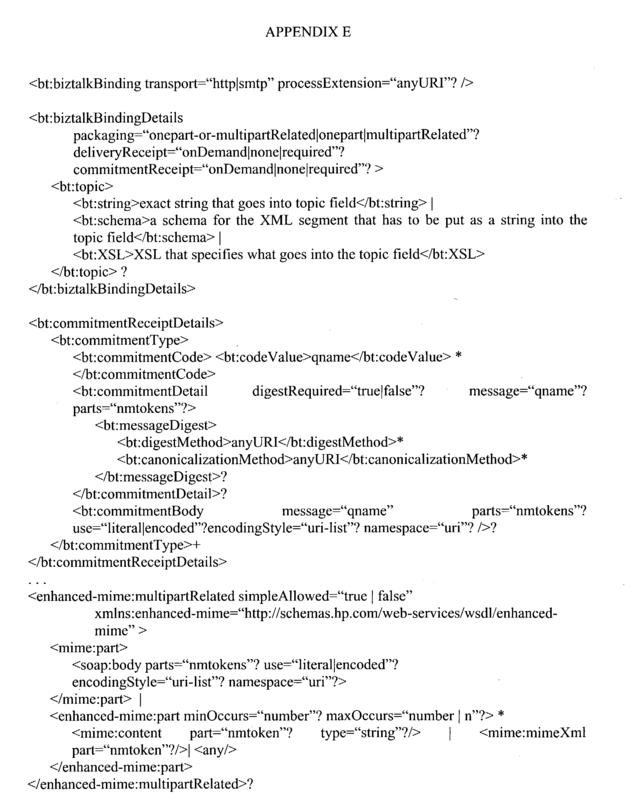 A portion, for example xmlns:enhanced-mime=“http://schemas.hp.com/web-services/wsdl/enhanced-mime”, of target namespace element  48 specifies that an element of an attachment extension 60 of exemplary web-services interface 58 starts with the string enhanced-mime although it may also include elements that start with the string mime. According to the above example, the multipart related type definition element comprises of a choice element. The choice element provides a choice to service provider  12 in how to define a part extension element 50 1′ of multipart related extension element 50′. According to the above example, service provider 12 may define part extension element 50 1′ in one of two ways. The first method references an element of type enhanced-mime:part, which is described in detail hereinbelow. Because the minimum occurrence value is zero and the maximum occurrence value is “unbounded”, using this method, service provider 12 may specify part extension element 50 1′ zero or more times. Thus, the message may optionally have attachments and/or may also have more than one attachment. A second method for defining part extension element  50 1′ is of type mime:part. 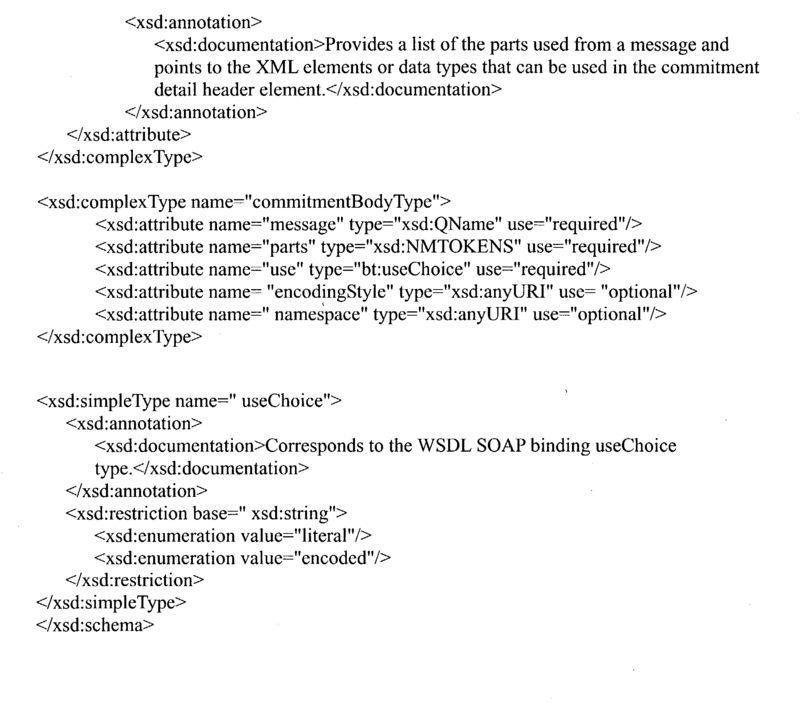 This method specifies that an existing method for specifying attachments may be used, for example a method as provided by a MIME binding of the WSDL specification as specified at http://www.oac.uci.edu/indiv/ehood/MIME/MIME.html. The multipart related type definition element also comprises a simple allowed attribute 50 2. According to the above definition, a simple allowed extension attribute 50 2′ of multipart related extension element 50′ is of type boolean. The default value of simple allowed extension attribute is “false”. Simple allowed extension attribute 502′ indicates whether a message uses a MIME multipart binding even when there are no attachments. A value of “false” for simple allowed extension attribute 50 2′ signifies that even if there are no attachments, preferably MIME multipart binding is used. According to the above example, web-services interface  18 specifies that “http” be used as the transport protocol for transmitting messages. Furthermore, a process extension as specified, for example at the URL http://schemas.hp.com/web-services/biztalk/process_WSDLextension may be used. The above example further specifies that the types of message acceptable by service provider 12 are those that comply with the messaging framework as specified, for example, by the URL http://schemas.hp.com/web-services/wsdl/biztalk, which is a URL that specifies a BizTalk messaging framework. According to the above example, packaging extension attribute  40 2′ has a value of “onepart-or-multipartRelated”, which indicates that the sender of the message may decide which format to use for message packaging. Delivery receipt extension attribute 40 3′ has a value of “required” (deliveryReceipt=“required”), which indicates that the message preferably includes a request for a delivery receipt. Commitment receipt extension attribute 40 4′ has a value of “on Demand” (commitmentReceipt=“on Demand”), which indicates that the sender of the message may decide whether to request a commitment receipt. If the sender desires to receive the commitment receipt, then the sender may include a request for the commitment receipt in the message. According to the above example, the commitment receipt may have a value of “okay”. According to a commitment details type parts extension attribute (part=“commitmentdetail”) of commitment detail extension element  44 2′ of the commitment receipt, the commitmentdetail part of the message commitmessage (porttypes:commitmessage) preferably appears within a header of the commitment receipt. According to a commitment body type parts extension attribute (parts=“no1 no3”) of commitment detail extension element 44 2′ of the commitment receipt, the no1 and no3 parts of the message commitmessage (porttypes:commitmessage) preferably appear within a body of the commitment receipt. A value of “literal” for the use attribute indicates that each part references a concrete schema definition using either the element or type attribute. According to the above example, the commitment receipt may have one of two values not_okay and okay_withconditions. According to a commitment details type parts extension attribute (part=“commitmentdetail”) of commitment detail extension element  44 2′ of the commitment receipt, the commitmentdetail part of the message commitmessage (porttypes:commitmessage) preferably appears within a header of the commitment receipt. According to a commitment body type parts extension attribute (parts=“no2”) of commitment detail extension element 44 2′ of the commitment receipt, the no2 part of the message commitmessage (porttypes:commitmessage) preferably appears within a body of the commitment receipt. A value of “literal” for the use attribute indicates that each part references a concrete schema definition using either the element or type attribute. Multipart related extension element  50′ preferably comprises a part extension element 50 1′ and a simple allowed extension attribute 50 2′. In the above example, the value of the simple allowed extension attribute 50 2′ is “true” (simpleAllowed=“true”), which indicates that the output message may be a simple SOAP message if there are no attachments or a mime-multipart message if attachments are present. APPENDIX E provides a generic definition for a binding element extension for a web-services interface in accordance with schema  34 of FIG. 3A and schema 46 of FIG. 3B. In the generic definition in APPENDIX E, a ‘?’ indicates an optional element, a ‘+’ indicates an element that can occur one or more times, and an ‘*’ indicates an element that can occur zero or more times. FIGS. 5A-5D illustrate a flowchart of an exemplary method for processing, in accordance with an embodiment of the present invention, a message received by service provider  12. Method 70 is preferably executed by the service provider upon receipt of a message 20. At 72, a determination is made as to whether web-services interface 18 requires that the received message comprise a delivery receipt request. This determination may be made, for example, by determining whether the value of delivery receipt extension attribute 40 3′ in web-services interface 18 is set to “required”. If the value of delivery receipt extension attribute 40 3′ is set to “required”, then at 74, a determination is made as to whether the received message comprises a delivery receipt request. If the received message does not comprise a delivery receipt request, then in block 116 an error message may be transmitted to the service requestor. Otherwise, the process starting at 78 may be executed. If in block  72 it is determined that web-services interface 18 does not require the received message to comprise a delivery receipt request, then at 76, a determination is made as to whether web-services interface 18 prohibits a delivery receipt request from being included in the received message. This determination may be made, for example, by determining whether the value of delivery receipt extension attribute 40 3′ in web-services interface 18 is set to “none”. If the value of delivery receipt extension attribute 403′ is set to “none”, then in block 80, a determination is made as to whether the received message comprises a delivery receipt request. If the received message comprises a delivery receipt request, then in block 116 an error message may be transmitted to the service requester. Otherwise, the process starting at 78 may be executed. If in block 76 it is determined that web-services interface 18 does not prohibit a delivery receipt request to be included in the received message, then the process starting at 78 may be executed. In block  78, a determination is made as to whether web-services interface 18 requires that the received message comprise a delivery commitment request. This determination may be made, for example, by determining whether the value of commitment receipt extension attribute 40 4′ in web-services interface 18 is set to “required”. If the value of commitment receipt extension attribute 40 4′ is set to “required”, then in block 82, a determination is made as to whether the received message comprises a delivery commitment request. If the received message does not comprise a delivery commitment request, then in block 116 an error message may be transmitted to the service requester. Otherwise, the process starting at 86 may be executed. 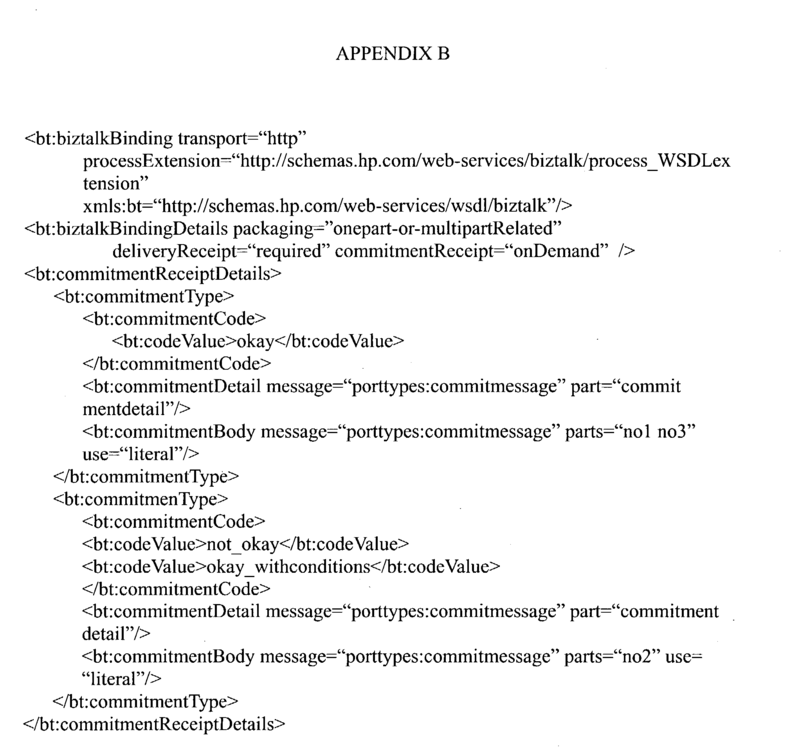 If in block  78 it is determined that web-services interface 18 does not require the received message to comprise a delivery commitment request, then in block 84, a determination is made as to whether web-services interface 18 prohibits a delivery commitment request from being included in the received message. This determination may be made, for example, by determining whether the value of commitment receipt extension attribute 40 4′ in web-services interface 18 is set to “none”. If the value of commitment receipt extension attribute 404′ is set to “none”, then in block 86, a determination is made as to whether the received message comprises a commitment receipt request. If the received message comprises a commitment receipt request, then in block 116 an error message may be transmitted to the service requestor. Otherwise, the process starting at 86 may be executed. If in block 84 it is determined that web-services interface 18 does not prohibit a delivery commitment request to be included in the received message, then the process starting at 86 may be executed. In block  86, a determination is made as to whether the transport protocol used for the received message corresponds to the transport protocol specified in transport extension attribute 37′ of web-services interface 18. If the transport protocol used for the received message does not correspond to the transport protocol specified in transport extension attribute 37′, then in block 116 an error message may be transmitted to the service requester. Otherwise, in block 88, a determination is made as to whether the message comprises a process element. If the message does not comprise a process element, then the process starting at 94 may be executed. If the message comprises a process element, then in block 90, a determination is made as to whether web-services interface 18 comprises process extension attribute 38′. If web-services interface 18 does not comprise process extension attribute 38′, then in block 116 an error message may be transmitted to the service requester. Otherwise, in block 92, a determination is made as to whether the value of the process element of the message corresponds to the value of process extension attribute 38′. If the value of the process element of the message does not correspond to the value of process extension attribute 38′, then in block 116 an error message may be transmitted to the service requester. Otherwise, the process starting at 94 may be executed. In block  94, a determination is made as to whether web-services interface 18 comprises packaging extension attribute 40 2′. If web-services interface 18 does not comprise packaging extension attribute 40 2′, then in block 96, a determination is made as to whether the received message is packaged according to a default packaging format, for example “multipartRelated”, “onepart”, “onepart-or-multipartRelated”, and/or the like. If the received message is not packaged according to the default packaging format, then in block 116 an error message may be transmitted to the service requestor. Otherwise, the process starting at 100 may be executed. If in block  94, it is determined that web-services interface 18 comprises packaging extension attribute 40 2′, then in block 98, a determination is made as to whether the received message is packaged according to the format specified in packaging extension attribute 40 2′. If the received message is not packaged according to the format specified in packaging extension attribute 40 2′, then in block 116 an error message may be transmitted to the service requestor. Otherwise, the process starting at 100 may be executed. In block  100, a determination is made as to whether web-services interface 18 comprises topic extension element 40 1′. If web-services interface 18 does not comprise topic extension element 40 1′, then in block 102, a determination is made as to whether a topic element field in the message is empty. If the topic element field in the message is not empty, then in block 116 an error message may be transmitted to the service requestor. Otherwise, the process starting at 106 may be executed. If in block  100, it is determined that web-services interface 18 comprises topic extension element 40 1′, then in block 104, a determination is made as to whether a topic field in the message correspond to the format specified in topic extension element 40 1′. If the topic field in the message does not correspond to the format specified in topic extension element 40 1′, then in block 116 an error message may be transmitted to the service requestor. Otherwise, the process starting at 106 may be executed. In block  106, a determination is made as to whether the message includes an attachment. If the message does not include an attachment, then the process starting at 114 may be executed. Otherwise, in block 108 a determination is made as to whether the message element in web-services interface 18 comprises multiple parts. If the message element in web-services interface 18 does not comprise multiple parts, then in block 116 an error message may be transmitted to the service requester. Otherwise, in block 110 a determination is made as to whether the parts in the message element describe the attachments to the message. If the parts in the message element do not describe the attachments to the message, then in block 116 an error message may be transmitted to the service provider. Otherwise, in block 112 a determination is made as to whether the format of the parts of the received message correspond to the format required by message binding extension element 36′ of web-services interface 18. If the format of the parts of the received message does not correspond to the format required by message binding extension element 36′, then in block 116 an error message may be transmitted to the service provider. Otherwise, the process starting at 114 may be executed. In block 114, the received message is processed. The present invention may be implemented in software, hardware, or a combination of both software and hardware. The software and/or hardware may reside on web-services server  22 and/or service requestor agent 24.
a binding details extension element operable to specify an availability status of at least one receipt for said message. 2. The web-services interface of claim 1, further comprising a commitment receipt details extension element operable to specify details regarding said at least one receipt. 3. The web-services interface of claim 1, further comprising a transport extension attribute operable to specify a transport protocol for transmitting said message. 4. The web-services interface of claim 3, wherein a value of said transport extension attribute is selected from the group consisting of “http” and “smtp”. 5. The web-services interface of claim 1, wherein said message comprises a request for said at least one receipt. 6. The web-services interface of claim 1, wherein said at least one receipt is selected from the group consisting of a delivery receipt and a commitment receipt. 7. The web-services interface of claim 1, wherein said at least one receipt comprises a delivery receipt operable to indicate acceptance of said message by an intended recipient of said message. 8. The web-services interface of claim 1, wherein said at least one receipt comprises a commitment receipt operable to indicate a commitment for processing of said message by an intended recipient of said message. 9. The web-services interface of claim 1, further comprising a packaging extension attribute operable to specify a packaging type for packaging said message. 10. The web-services interface of claim 1, further comprising a packaging extension attribute operable to specify that a packaging type for said message is determined by a sender of said message. 11. The web-services interface of claim 1, further comprising a packaging extension attribute operable to specify that said message is part of a multipart message. 12. The web-services interface of claim 1, further comprising a delivery receipt extension attribute operable to specify that said at least one receipt comprises a delivery receipt for indicating acceptance of said message by an intended recipient of said message. 13. The web-services interface of claim 1, further comprising a commitment receipt extension attribute operable to specify that said at least one receipt comprises a commitment receipt for indicating a commitment for processing of said message by an intended recipient of said message. 14. The web-services interface of claim 1, further comprising a commitment code extension element operable to specify at least one value for inclusion in a header of said at least one receipt. 15. The web-services interface of claim 1, further comprising a commitment detail extension element operable to specify contents specific to said web-service for inclusion in a header of said at least one receipt. a commitment details type parts attribute operable to specify at least one part of said message for inclusion in a header of said at least one receipt. 17. The web-services interface of claim 1, further comprising a commitment body extension element operable to specify contents specific to said web-service in a body of said at least one receipt. a commitment body type parts attribute operable to specify at least one part of said message for inclusion in a body of said at least one receipt. a binding details extension element operable to specify an availability status of at least one receipt for a message requesting said web-service; and. a commitment receipt details extension element operable to specify whether said at least one receipt is one of the group consisting of a delivery receipt and a commitment receipt. 20. The web-services interface of claim 19, wherein said message comprises a request for said at least one receipt. specifying an availability status of at least one receipt for said message. 22. The method of claim 21, further comprising specifying whether said at least one receipt is one of the group consisting of a delivery receipt and a commitment receipt. 23. The method of claim 21, further comprising specifying a transport protocol for transmitting said message. 24. The method of claim 21, further comprising specifying a packaging type for packaging said message. 25. The method of claim 21, further comprising specifying that a packaging type for said message is determined by a sender of said message. 26. The method of claim 21, further comprising specifying that said message is part of a multipart message. 27. The method of claim 21, further comprising specifying that said at least one receipt comprises a delivery receipt for indicating acceptance of said message by an intended recipient of said message. 28. The method of claim 21, further comprising publishing the specified format. 29. The method of claim 21, further comprising specifying that said at least one receipt comprises a commitment receipt for indicating a commitment for processing of said message by an intended recipient of said message. 30. The method of claim 21, further comprising specifying at least one value for inclusion in a header of said at least one receipt. 31. 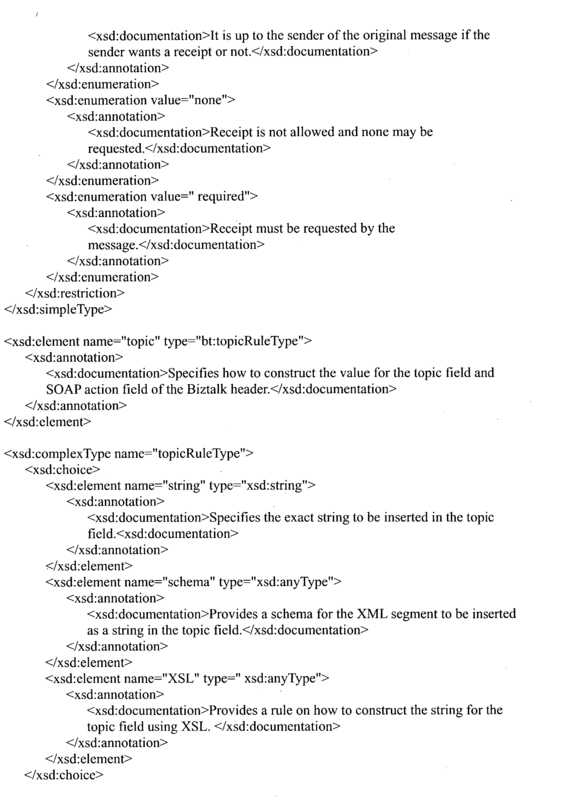 The method of claim 21, further comprising specifying contents specific to said web-service for inclusion in a header of said at least one receipt. specifying at least one part of said message for inclusion in a header of said at least one receipt. 33. The method of claim 21, further comprising specifying contents specific to said web-service for inclusion in a body of said at least one receipt. specifying at least one part of said message for inclusion in a body of said at least one receipt. processing said web-services message in response to said web-services message being in said specified format and comprising a valid delivery receipt request. 36. The method of claim 35, further comprising comparing a process element of said web-services message with a process extension attribute for said web-service listed in a web-services interface to determine whether said web-services message is in said specified format. processing said web-services message in response to said web-services message including said delivery receipt request and upon determining that said web-services interface requires said web-services message to include said delivery receipt request. processing said web-services message in response to said web-services message not including said delivery receipt request and upon determining that said web-services interface prohibits said delivery receipt request from being included in said web-services message. processing said web-services message in response to said web-services message not including said delivery commitment request and upon determining that said web-services interface prohibits said delivery commitment request from being included in said web-services message. 40. The method of claim 35, further comprising transmitting an error message in response to said web-services message comprising an invalid delivery receipt request. 41. The method of claim 35, further comprising processing said web-services message in response to said web-services message being packaged in accordance with a packaging format specified in a packaging extension attribute of a web-services interface.